Oh The Changes I Have Seen in Genealogy! When writing my blog post on The Importance of Genealogy Societies in an Age of Digital Technology it got me thinking about how much genealogy has changed since I started researching my family history. I have been doing family history research since the mid-1970s. A school project got me started when I was 11 years old. To find out about my Mum’s family letters had to be written to family members in Ireland and England to get information. This required writing the letter on the blue flimsy airmail paper, posting it and then waiting for a response. Everyday you excitedly waited for the mail to be delivered. My Dad’s parents lived near us so a visit to Granny and Grandpa helped me to find out about his side of the family. This is one of the family trees I got from a Grand Aunt. Every time I visited family in Ireland I asked more questions and gathered information. In the 1980s I started doing actual research. 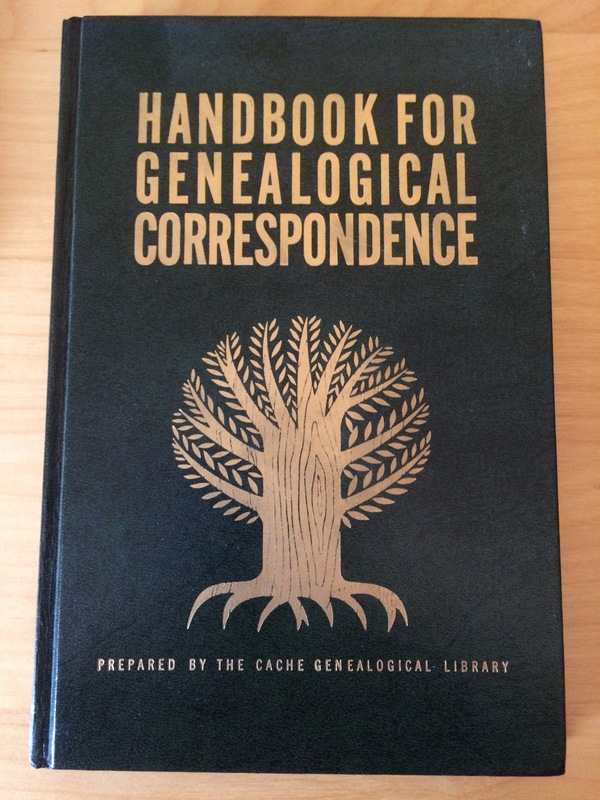 One of the first books in my genealogical library was “Handbook for Genealogical Correspondence” prepared by the Cache Genealogical Library. It was an American book first published in 1974 and I got the third edition from 1980. Writing letters was one of the main ways to do research from a distance. 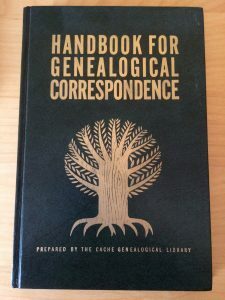 This book included the “essentials of a genealogical letter” writing to relatives, libraries, archives and other repositories. They gave you tips to write to “church record keepers” and “public officials.” There was a section under “public officials” about writing a letter to get information about a census record. These days we just go on the internet and search a census in a matter of minutes, if you are lucky. There was a section on why letters were returned and the responsibly of the Post Master. They looked at International Reply Coupons. Who out there remembers these? IRC’s for short, they were purchased from your local post office and were included in a letter to provide return postage when writing to another country. It was always protocol to include a self-addressed stamped envelope when sending a written query. In the mid-1990s I was on the internet researching my family history with my dial up connection. Remember that long loud screech? There weren’t many databases online but you had message boards where you could post information about family branches you were researching. People from around the globe were coming together to share information. You also had email which was faster and less expensive than the postal service especially for overseas correspondence. Sharing information still required the postal service. When I do a google search on some family names those online queries I posted more than a decade ago pop up in the results. The internet opened things up. 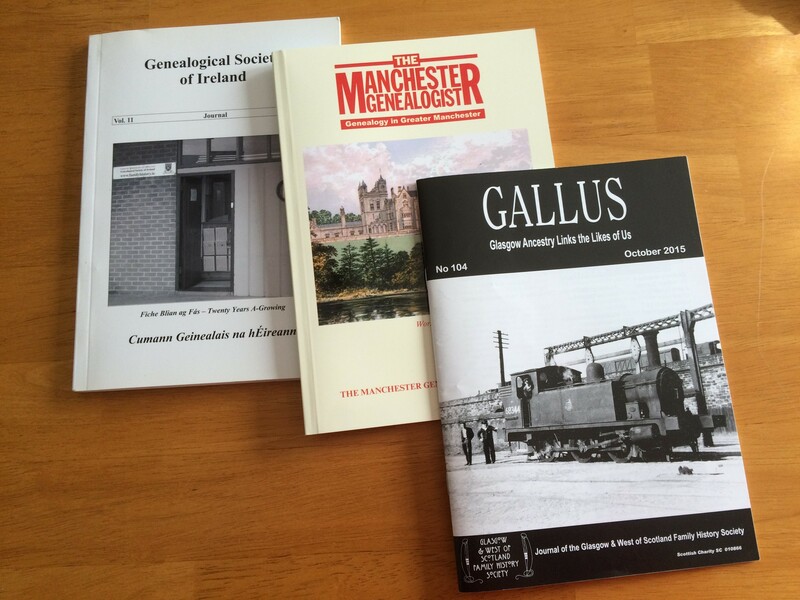 I used to subscribe to the Genealogical Research Directory. Anyone out there remember the GRD? This was edited by a couple of gentlemen from Australia. You would pay your yearly subscription fee and that would include a certain number of entries in the book. Then you would wait for the large book to arrive in the mail. Near the end of the run they used CDs. When the book arrived you would go through it and see if you could find anyone searching for the same families you were researching. Then a letter, and eventually an email, was sent off and you waited. I found several distant cousins this way. It was something I looked forward too each year. A local library had older versions of the book and I started off searching those for information before I subscribed myself. These books were about three inches thick and took up a lot of room on the shelf. There was a point in the 1990s and early 2000s where people were buying CDs with genealogical information on them. You used to go to the Family History Centre or local library to view census records on CDs. How many computers come with a CD player now? Family history societies were important because their journals would have articles that could help with our research, provide information on a previously unknown local resource and the societies also provide research help for those who were not able to go to the local repositories. Their importance hasn’t changed in the days of the internet. In fact I would say they have become even more important when you are searching a particular area. No one knows the local records better than the family history society, except perhaps the local history librarian. Then Ancestry arrived on the scene. This opened up a whole new world to people researching their family history. It was the first time that you could access information quickly and at home, or the local library depending on where you had access to the database. Now there are other large companies putting a great number of genealogical databases online. They are not the only ones because some of the larger family history/genealogical societies have put specific databases online for their members. The National archives and libraries of several countries have put digital images of their records online. Some are free to access and some are behind a pay wall. This is not an inexpensive process. It costs millions to provide records in digital format. These records are preserved as long as the format they have been digitized in keeps up with the changes. I have been though all the changes in family history in the last forty years. Some have been good and some not so good, but then that’s life. The influx of genealogical records online has made more people interested in their family history. There are still a large cross-section of countries that don’t have a lot of information online and old fashioned research is still required. Those countries that do have a lot of information online you will find that it’s still not everything and you will have to go and do research in an archive, library or other repository. The online databases are a great tool and they help you to move forward at a quicker pace than forty years ago. Everyone will get to a point where they will have to get down and dirty looking at old records. I say dirty because you will get dirty looking at old records. They have the ages of time on them and it rubs off on you. I like the ease of doing research online but I truly enjoy getting down and dirty in local repositories and doing the research in the actual records. There is something very satisfying about touching an original document that records an ancestor’s baptism in 1769. All hail the dirt of the ages! I began my family history research about 20 years ago. I too remember the days when we had to order census records at the local Family History Center. We’d have to wait for the microfilm to arrive. It’s amazing how things have changed for the better. Now I can look at census records in the comfort of my own home. Awesome! Thanks for including me on your Fab Finds Jana! It is awesome Jana. I like finding things online but still have the most fun in the repositories looking at the actual records. When you visit the repositories you can talk to the archivist and librarians and get their advice on researching their records. Always a good resource.